This month the challenge at Scrap Our Stash is to re-do an early project. Maybe a layout from your early days of scrapping or a photo from an early album is begging for a face lift. If nothing else, this challenge showed me how my scrapping has changed over the years! 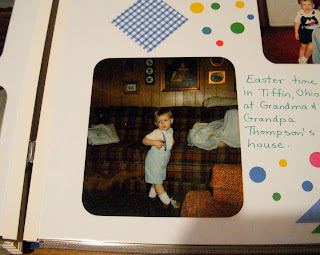 My Old Layout: Creative Memories album, chronological (Spring 1987), photos from a time frame of a few months. Not even going to talk about design here. It is what it is. Amazingly, I still had a copy of this photo and a few others lying around. A tricky proposition to go this far back because we were shooting non-digital then - harder to retrieve a photo. 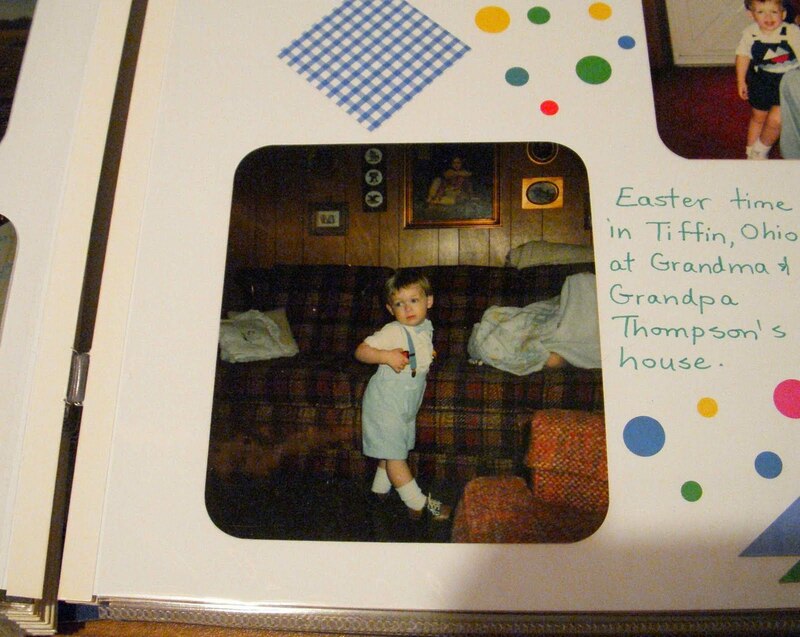 My New Layout: Library of Memories album, thematic (grandma's house), photos from a longer time frame of at least a year. And let's just say I'm much happier with the design. 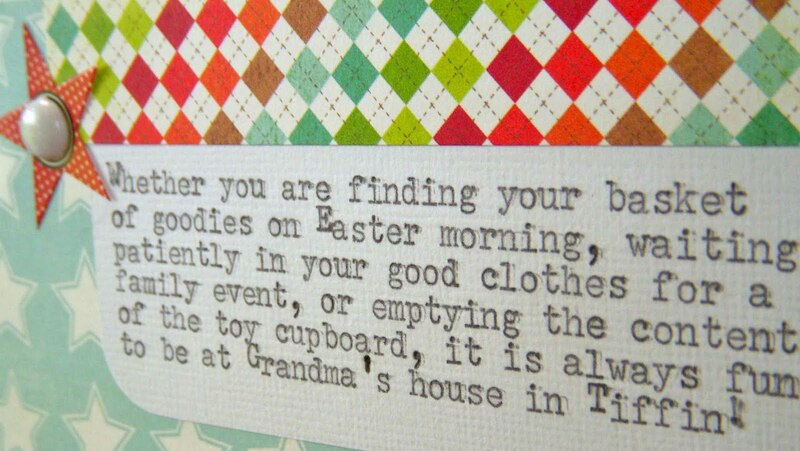 Journaling Reads: "Whether you are finding your basket of goodies on Easter morning, waiting patiently in your good clothes for a family event, or emptying the contents of the toy cupboard, it is always fun to be at Grandma's house in Tiffin!" There's nothing "right" or "wrong" about either approach. I love both layouts because they capture precious memories. What I'm doing has not changed, only how I'm doing it. I'm perfectly fine with showing that evolution in my albums. Who knows where I might be five or ten years from now? 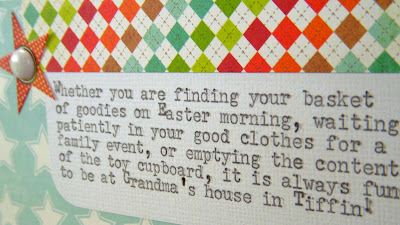 That's what makes this hobby so much fun! Ready to take on this challenge? All the details are here. Wonderfully done, I have a particularly CM type of layout that always comes to mind when the subject of re-do comes up. I just haven't had the "courage" to tackle it yet. Love your new layout! Fun bright colors and it is interesting to see how you would do something now. My early layouts are so basic, but I still love them just as they are. BTW, still loving that typewriter! Great new layout. Love the typed journaling and the placement at the top of the page! Hmm, I wonder if someday you'll redo your redo. 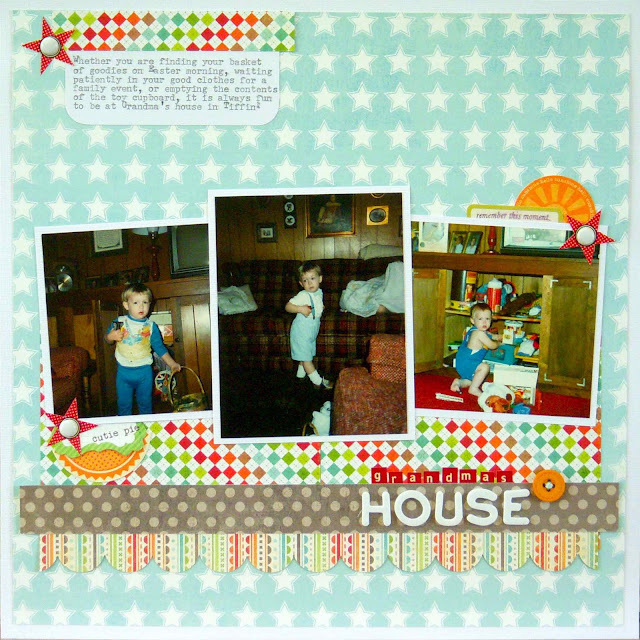 I love seeing old layouts...they're fun to see how things have changed! I do LOVE the new layout...great colors and design! Love the redo. My old pages look very similar. Love your redo.. Your color combo's are amazing. Thanks for sharing. Oh, I love the redo!! I laugh when I look back at my old layouts too! Someone should have jerked those deckle-edged scissors right outta my hands!!! ScrappnBee, that's a great question! On the CM pages, the information is pretty basic and somewhat redundant. Now, I try to look beyond what is obvious in the photos to tell my story. So cool! I love it. Great redo. Love this Sue! Isn't if fun to see how your style has changed since starting in this hobby? I have CM albums that look much like yours!! Love all the color in the 2nd layout and the emphasis in the journaling. Very nice! Absolutely love the re-do, love the colors, the embellishments, all of it!! And wow, did that first page bring back memories of my first layouts, I love how this hobby has evolved! Oh my, what a difference! The update is just fabulous from a design standpoint, and how fortunate you could lay hands on those photos -- so precious! I like how you used the same photo over & have a different theme/topic for your layout, yet you didn't undo what you had completed before. I have no intention of re-doing any of my old stuff, but I have been adding some layouts using photos that I've already scrapped or included in previous photo albums. Oh my goodness, Sue, what a fab redo! 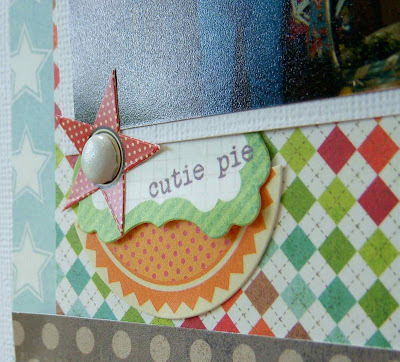 Scrapbooking has come so far in the past decade and I have many of those pages with little tiny circles and squares. I still have some of those old CM stickers too - they come in handy with my youngest daughter. Oh I love the bright and happy hues on your re-do layout! Just lovely!